Every year, Abercrombie & Fitch hosts a festival benefiting SeriousFun Children’s Network, a global network of camps and programs for kids with serious illnesses and their families. The event is held at the A&F Home Office in Columbus, OH and this year (2017) they invited us to join! 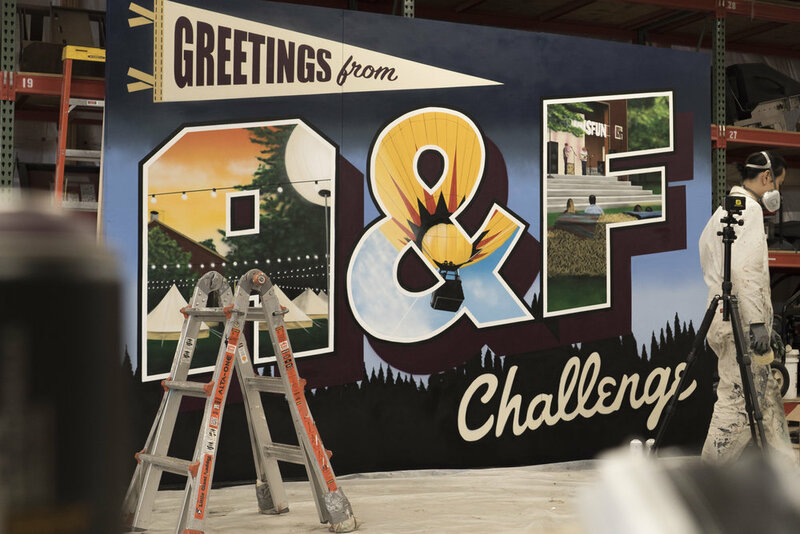 They reached out to us after seeing our mural at Firefly and we immediately realized that we both already had ties to A&F. Victor used to manage their email marketing back at his old corporate job and Lisa used to work as a brand representative in high school. We both felt honored to be asked to be part of such a positive project. Arriving at their home office, the team gave us their campus tour and we quickly got to work. They own quite a bit of land, so we camped there for 3 days as we brought the mural to life in the barn where we painted. One advantage of painting at the A&F home office was using their gym, showers and wonderful cafe during the day. We both had a great time at the A&F event where there was fun really for everyone. They brought in several different bands, tons of amazing food, DIY arts and crafts, hot air balloon rides, zip lining...you name it! They placed our mural right next to the main stage where attendees could snap a selfie or a big group photo.